Think the Windy City is just for grownups? Think again. The wide selection of kid-friendly museums, restaurants, shops, shows and gardens makes Chicago an exciting city to visit with little ones. The best things to do with kids are centrally located and require little or no transportation—a huge plus for families. And the icing on the cake? These kid-friendly attractions are enjoyable for adults, too. But what does kid-friendly or family-friendly really mean? To answer this, we asked Amanda Simkin of Queen of the Land of Twigs 'n Berries. "For busy urban families like mine, 'family-friendly' means that my kids are acknowledged and welcomed...along with their stroller. Boutiques that put out toys for kids to play with while parents browse and restaurants with healthy fare that kids will actually eat are the prime example of what 'family-friendly' businesses look like in Chicago." Fortunately Chicago has a lot of that! We also asked Amanda her favorite places to visit in Chicago with her family. "We are spoiled rotten by Chicago's Museum Campus. From the interactive Crown Fountain and massive Maggie Daley Park to the hands-on learning at MSI and Shedd Aquarium, there is nonstop fun for kids and adults of all ages. Our world class museums are inspiring a new generation of thinkers who will undoubtedly make the world a more thoughtful place." We agree! 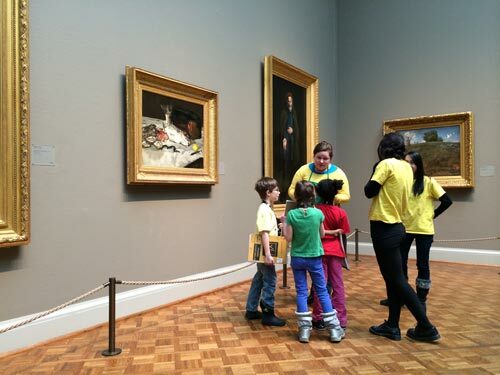 Check out the awesome things to do in Chicago with kids at these locations below. Shedd Aquarium is quite possibly one of the coolest aquariums around. The animal collection is diverse and global, the architecture is stunning, and the learning opportunities are boundless. Every member of the family will find their curiosity piqued here. 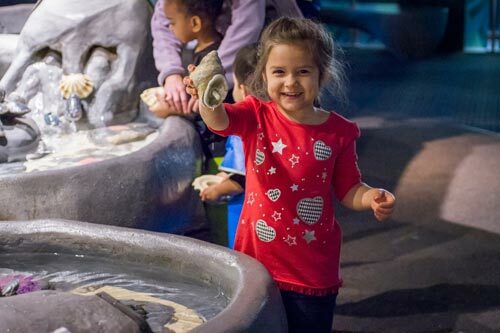 Kids will enjoy: The Polar Play Zone, where they can dress up like penguins, explore Arctic waters in a kid-sized submarine, watch Beluga whales, and touch live sea stars. Parents will love: How exhibits like "At Home on the Great Lakes" inspire them to consider their impact on local and global ecosystems. Hearing animal trainers and caretakers explain how the animals are cared for on a daily basis is interesting, too. Where's the food? : Grab a snack at one of two cafés or sit down to a family friendly meal at The Bubble Net. Don't miss out on a visit to the largest science museum in the Western Hemisphere! MSI brings science to life for children and adults through interactive exhibits that encourage inventive thinking. If you've explored all the museum has to offer, take a walk around the museum's expansive lawns. Kids will enjoy: Watching chicks hatch from their eggs right in front of their eyes. Older kids will be interested in the ethics of genetic research. Parents will love: Checking out the truly humbling It's All About You exhibit alongside the small humans they created. But honestly, parents will love just about all of the museum's insightful and unique exhibitions. Where's the food? : Put the cherry on top of a perfect museum day with a sundae from old-fashioned Finnigan's Ice Cream Parlor. Skydeck Chicago provides visitors with the opportunity to take in spectacular city sights from a unique vantage point. Its museum-quality exhibits and engaging experiences like "The Ledge" take fun to the next level. 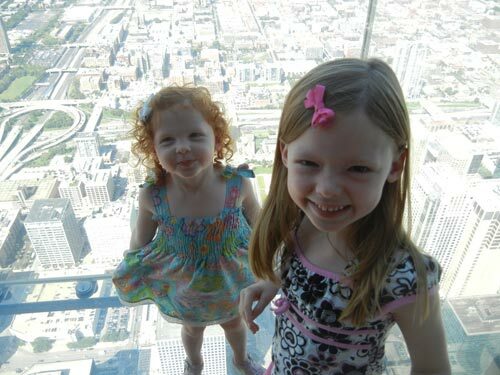 Kids will enjoy: Finding other Chicago landmarks in a scavenger hunt provided on the Skydeck website. Can you spot them all? The views are pretty neat, too. Parents will love: Amazing views, museum-quality exhibits, and getting the perfect family photo. 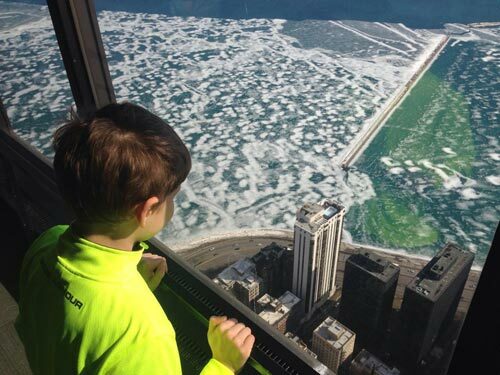 Some parents might also get a kick out of totally freaking their kids out on The Ledge—we won't judge. Where's the food? : Munch on a Chicago-style hotdog from The Eats & Treats Café, located on the ticketing level. 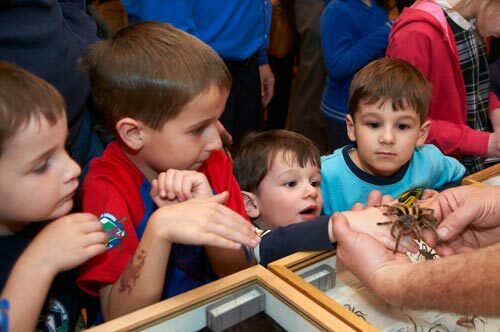 The Field Museum is an open invitation for visitors to embark on a journey of scientific discovery. Immersive exhibitions are sure to inspire curiosity and further understanding, making the museum a truly educational experience for all ages. Kids will enjoy: The Crown Family Playlab, an interactive space that invites kids to experience science through hands-on creative play. Kids will also love "shrinking" smaller than a penny in the Underground Adventure exhibition. Parents will love: The life-size replicas and interactive exhibitions, ranging in topic from DNA to rare jewels to man-eating lions (to name a few). Plus, this is where SUE the T-rex lives. Where's the food? : The family-oriented menu at the Explorer Café features locally purchased products that support the Museum's educational and sustainable vision, making it the perfect place to fuel up for learning. Located at the heart of downtown Chicago, the 360 Chicago experience is as convenient as it is exciting. Take in spectacular 360-degree views from one thousand feet up or, if your family is a daring set, try the exhilarating TILT attraction, which literally tilts visitors to a 30-degree angle over Michigan Ave. 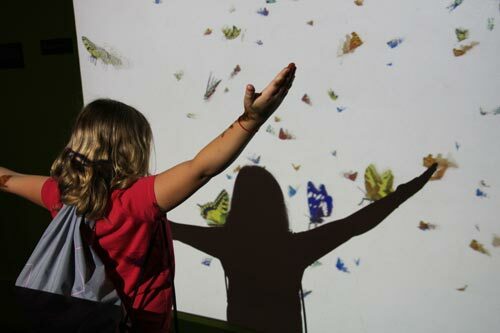 Kids will enjoy: The interactive panoramic touchscreens. 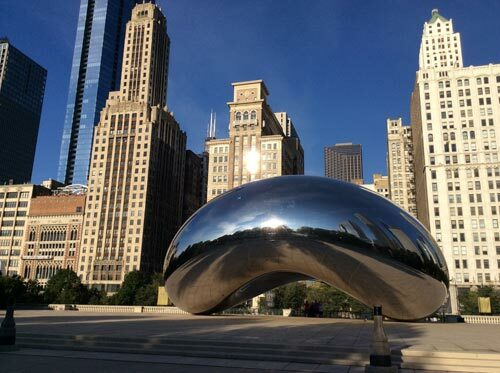 Teens will enjoy: Sharing their #360CHICAGO pictures on their favorite social media platform. Parents will love: The fantastic 360 views, especially the downward facing views on the moving TILT experience. Where's the food? : The Architect's Corner offers artisanal snacks, coffee and a full bar with daily cocktail specials. Cheers! Explore the final frontier with Adler Planetarium's engaging, user-friendly exhibits that are well suited to children and adults alike. The Adler seamlessly merges education and scientific wonder, and is the perfect place to take aspiring scientists. Kids will enjoy: Taking a rocket to "Planet X" where they can climb, crawl, and play in the name of science and learning. They can also launch their own rocket or create an object that will stay suspended in a wind tunnel. 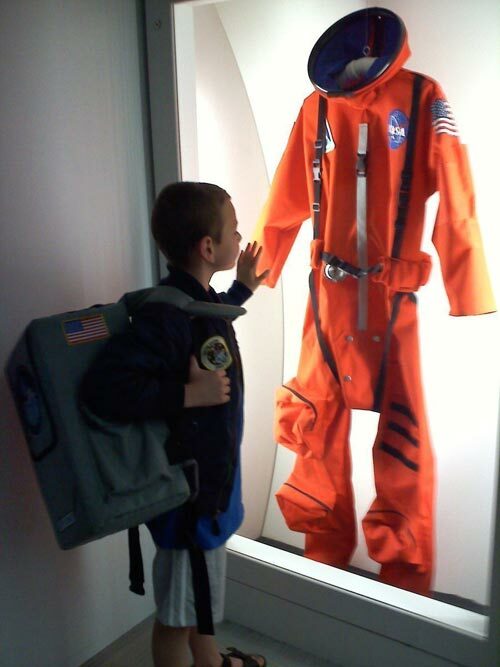 Parents will love: Experiencing genuine smallness and wonder similar to what their little ones must feel on a daily basis, while walking through exhibits like The Universe. Adults will also enjoy experiencing (or reliving!) America's first steps into space in the interactive Mission Moon exhibit. Where's the food? : Galileo's offers fresh café fare and a stunning view of the city skyline. A trip to the windy city without visiting the Art Institute of Chicago would be incomplete; it's one of the oldest and best ranking museums around when it comes to visitor satisfaction. The stunning curation of the museum guarantees that every member of your group will find a style, artist or piece that speaks to them. Kids will enjoy: Being invited to partake in discussions that allow them to form opinions relating to their viewing experience. Artist's workshops allow kids to create their own art to take home. Parents will love: Seeing a wide range of familiar and new works. Parents will also find that utilizing the museum's many programs and resources is an effective way to introduce kiddos to a wide variety of artists and styles. The fact that kids under 14 get in for free doesn't hurt, either. Where's the food? : The Museum Café puts a twist on typical café fare with its globally-inspired menu. 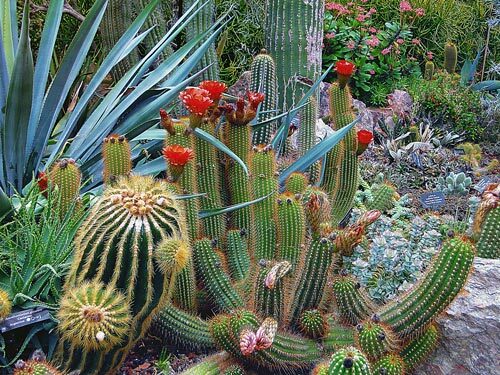 Kids will enjoy: This botanical garden specialized drop in activities made just for kids! Throughout the week the Chicago Botanic Garden provides these fun kid activities at the the learning campus either in the Gruensfield Children’s Growing Garden or Kleiman Family Cove. Parents will love: The Chicago botanic garden’s serene atmosphere. Parents will love the relaxed environment and endless gardens to discover with there little one. Where's the food? The Garden View Cafe which provides a refreshing selection of local and sustainably produced foods in it’s menu. If you've finished up a day at the museum, be sure to spend some time in Chicago's front yard—Grant Park. 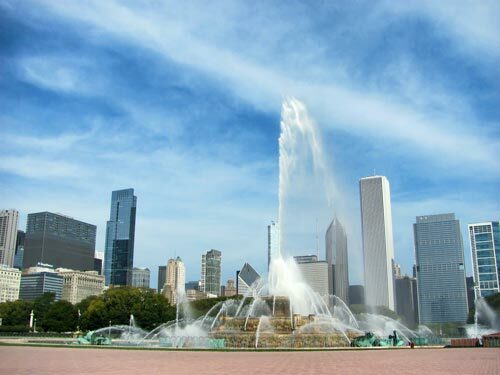 With a series of parks and features, including baseball diamonds, the Museum Campus, and Buckingham fountain, it's easy to spend a whole day on a relaxing stroll with the family. Kids will enjoy: Running around in any of the many large open spaces in summer and ice skating in the winter. Parents will love: The people watching opportunities at a variety of parks, gardens and fountains. Stumbling upon unique events and festivals in the park just adds to the experience. Where's the food? : Grant Park is in close proximity to a plethora of dining opportunities. Millennium Park offers state-of-the-art sculptures (Cloud Gate, aka The Bean) and landscape design that make for awesome family photos, so don't forget the camera! 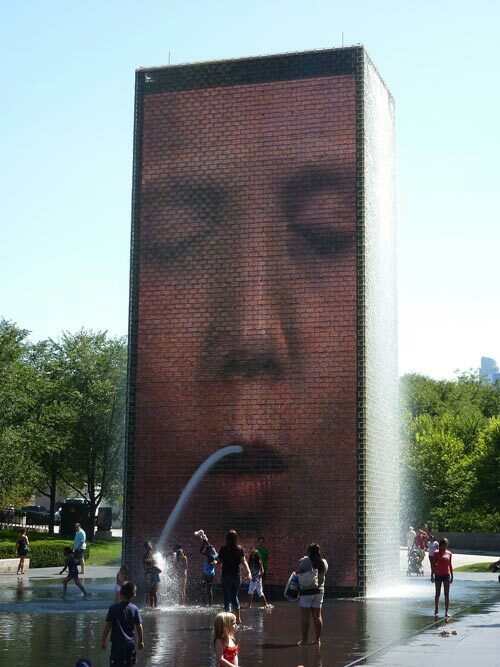 Kids will enjoy: Watching 50-foot tall faces spit water out of their mouths at Crown Fountain. Parents will love: How architecture and landscape combine with art and sculpture to create a uniquely modern public space. Where's the food? : Drink beer at the Goose Island Beer Garden while you decide which of the delicious food trucks to eat at. Be sure to stop in at Cloud Gate, affectionately known as The Bean, located in Millennium Park. Little ones will love looking at their reflections, and big kids and adults are in for some 3D funhouse mirror laughs. Kids will enjoy: Studying how the surface of the metallic bean warps and multiplies reflections from different angles as they make faces. Parents will love: The immensity and charm of the interactive sculpture, not to mention the holiday-card-worthy photo-ops. Cloud Gate is stunning all year round. Where's the food? : Literally all around! 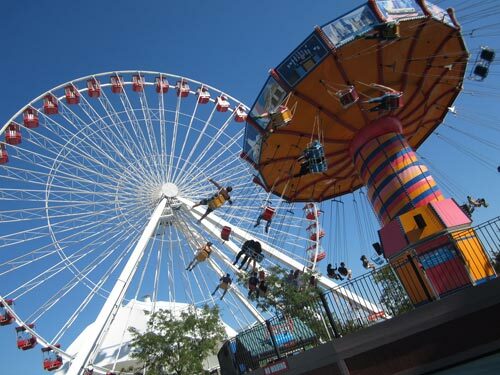 Navy Pier is a Chicago landmark and the perfect place to spend a day with a family—no matter what you're looking to do. Be sure to check out the "today's events" section of the Navy Pier website for a complete listing of the many unique current and upcoming events at the Pier. Kids will enjoy: Riding the 1920s style carousel at Navy Pier Park or a visit to the Chicago Children's Museum. Parents will love: Learning, sightseeing, shopping and people watching all from one central, historical location. Where's the food? : The range of available options at the classic food court is sure to please every member of the family. 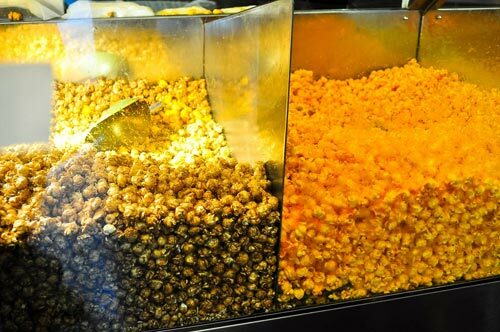 The one and only flaw of Garrett's gourmet popcorn is that its heavenly aroma and one-of-a-kind flavor will leave you wanting more indefinitely. It's okay to buy everyone their own tin here. Kids will enjoy: Trying to decide on their personal favorite popcorn flavor. Tried and true butter? Spunky pecan caramel twist? Parents will love: The irresistible combination of sweet brown sugar crème brûlée and savory sharp cheddar cheese popcorn, coined the Garrett Mix. Don't knock it 'til you've tried it, folks. 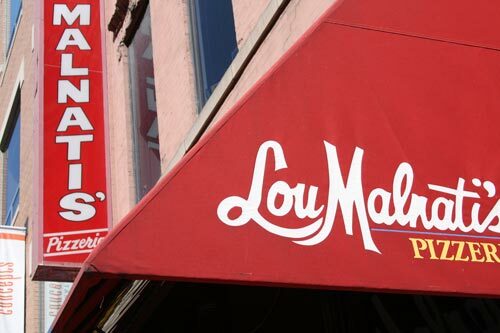 With a signature deep-dish recipe handed down through generations, Lou Malnati's is often cited as having the best pizza in Chicago. We suggest you be the judge. Kids will enjoy: Devouring buttery, flakey, gooey hot pizza of course! Parents will love: Experiencing authentic, Chicago-style deep-dish pizza at one of the most iconic restaurants in the city. The restaurant is also in close proximity to family attractions like the Museum Campus, making it as convenient as it is delicious. Looking for other great places to eat with the family? Amanda has lots of recommendations . But her family's favorite places to eat "are those with great stories and histories, such as Margie's Candies , Superdawg , and the Walnut Room at Macy's. I frequented these restaurants with my family when I was a kid, and I love repeating the tradition with my own family. A meal at the Walnut Room during the holidays is the quintessential Chicago Christmas tradition."